Dairy Queen Blizzard Maker is the fun way for kid's to make their own DQ blizzards at home. Make ice Dairy Queen Blizzard with the 3 provided packets of mix and the pop rocks. Easy Clean-up, Dishwasher Safe. 1 DQ Blizzard Maker, 3 DQ flavour pckts, 3 popping candy, 1 coupon booklet, an I/S, 2 cups. 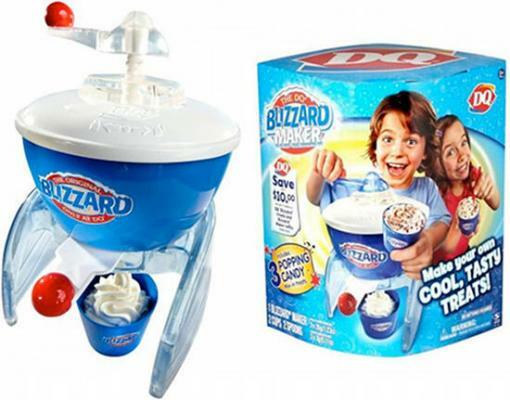 Also includes 2 DQ spoons, 1 Paddle for Mixing Ice Cream, and 1 Plunger for Extruding Ice Cream.